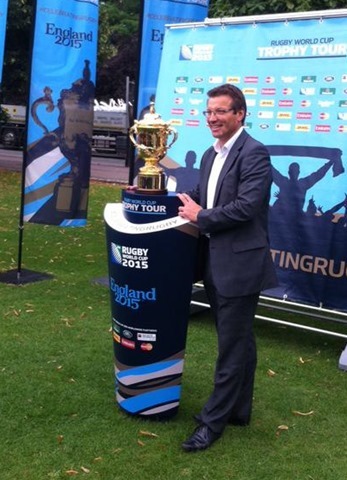 The 100 day-long trophy tour around the UK has been a long time in the planning with the first meeting about where the Webb Ellis Cup could go first discussed at a Regional level in November 2013. This was when we were asked to come up with some iconic locations where the Trophy could be displayed and get maximum exposure to the public and the media. This proved to be easier said than done although we had the advantage of having the Cup in our area for two days rather than the one day most CBs had it for as we were working jointly with Cambridge University. I heard other areas talking about taking the Trophy to Althorp House, The Angel of the North, to the top of Scafell Pyke and to Chatsworth House, but we couldn’t think of anything as iconic in East Anglia. We wanted if possible to go to all three of our counties and we put forward a number of suggestions including a trip on the Norfolk Broads and making a connection with Nelson’s birthplace but all those in Norfolk were rejected leaving us with five venues over two days. It was an early start on Tuesday 11 August with a live interview with BBC Suffolk at 6:10am (BBC Norfolk and Look East had called me the day before) then on the road from Colchester soon afterwards to drive up to Lowestoft to Ness Point, the most Easterly point in the UK in time for 8:15 when the Trophy was due to arrive. Despite its unique geographic location, Ness Point isn’t much of a tourist spot being located behind an industrial estate with a distinct sulphurous odour in the air. Despite that there were a dozen or so people that turned up to see the cup and take photographs. 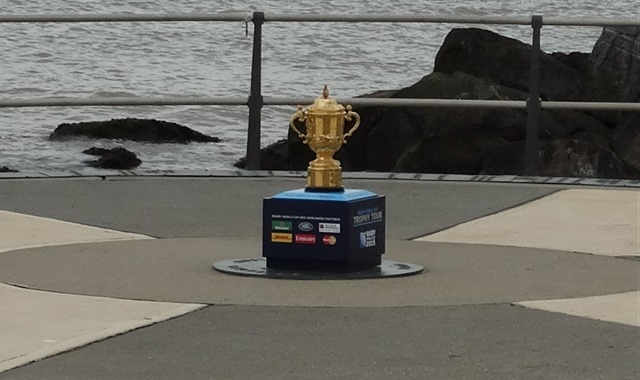 Then it was a short trip to Lowestoft & Yarmouth RFC where the advance party had already set up, just needing the Trophy to put on the waiting plinth. 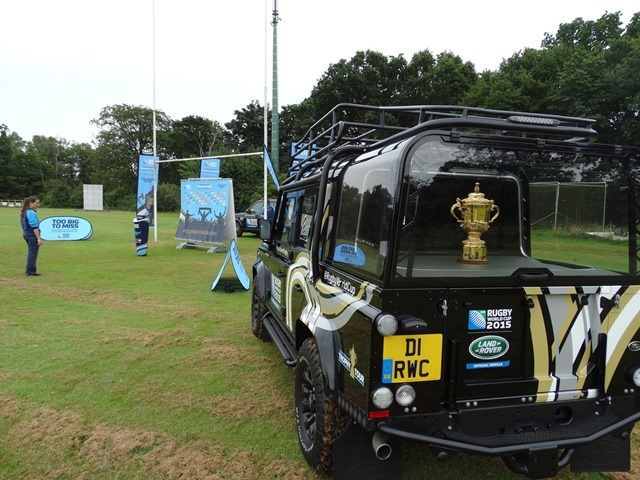 The cup arrived in its specially made Land Rover with a glass surround allowing it to be on view as it tours the country and although it was half an hour early, a queue soon formed. For the next two hours a steady stream of people snapped away and stayed to chat with friends and colleagues. There was a really nice atmosphere all morning as club members and guests, including council officials and the local MP milled around while reporters from local TV, radio and press interviewed various people. I left early to get to Ipswich and Cromwell Square where there is a statue to Russian Prince Alexander Obolensky. I was very pleased that this venue was chosen as although East Anglia is short of big and iconic places or structures, this was somewhere that had a true connection to an icon of English Rugby. Prince Obolensky made his debut for England in 1936 where, playing on the wing he scored two tries against New Zealand, the second of which is reckoned to one of the best ever scored at Twickenham, and help record England’s first ever win against the All Blacks. During the Second World War he joined the RAF but in 1940 he tragically died in a training accident while flying his Hurricane at Martlesham Heath and his remains are buried in a cemetery in Ipswich. 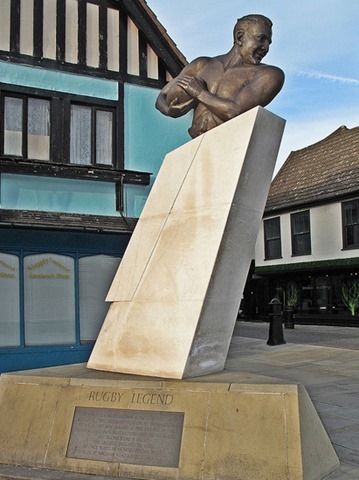 About ten years ago there was a campaign to have Obolensky recognised for his feats as a rugby player and RAF pilot and with financial help from local businessman Graeme Kalbraier and Roman Abramovich amongst others, the statue was erected in 2009 and unveiled by Princess Alexandra Obolensky, the Prince’s niece. The Princess came back to Ipswich to greet the Webb Ellis Cup along with the son of the player that passed her uncle the ball for one of his tries almost 80 years ago. The event went very well thanks to Ipswich Borough Council who gave a lot of support and to Mel Tillett and her staff at @Twenty5, a lovely restaurant just by the statue who kept guests and RWC crew fed and watered. A bouncy rugby pitch, the Ipswich Hospital band and touch rugby kept everyone happy while hundreds patiently waited to have their photos taken. One of the guests was Harry Gray, the sculptor of Obolensky’s statue, with whom I spent time talking about some of the research he had done before coming up with the design. He then told me that he had been commissioned by the RFU to replace the big wooden gates outside the West stand at Twickenham with wrought iron gates to commemorate those that died in the 1914-18 and 1939-45 wars. He showed me a sneak preview but it would be unfair of me to describe them before they have been officially approved, however they are very evocative of those times. Once again I left while there were still dozens of people queuing to have their picture and I made my way to Colchester Rugby Club. I got there about 4pm, an hour before the Trophy was due to arrive and there were already a couple of hundred people milling around. 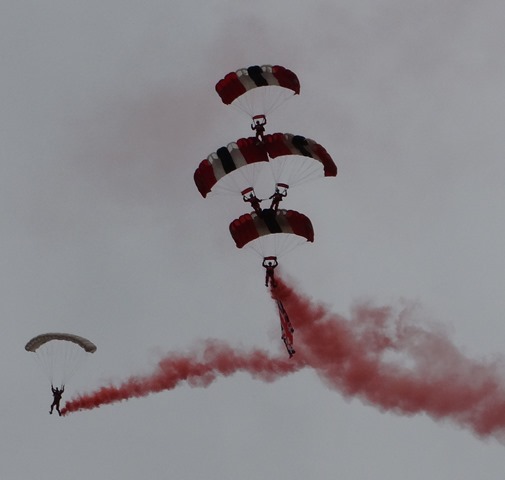 Other than the Webb Ellis Cup the main attraction was going to be The Red Devils Parachute Regiment Display Team who were going to drop in a match ball. This idea came about when I called into Colchester RFC on my way back from another game early a little over a year ago. A couple of Paras who had been playing for one of the lower teams were in the bar and I asked if there was any way that the Parachute Regiment could be involved with the Trophy Tour given their close association with the town and the rugby club. They gave me the contact for the Red Devils and after several phone calls and emails it all came together. They didn’t disappoint. ITV Anglia broadcast live from the Rugby Club and the display team of eight soldiers put on a great show much to the delight of the crowd that was at least a thousand strong. Once again there was a long but patient queue to have pictures taken with the Trophy and like Lowestoft there was a friendly, cheerful atmosphere. The various social media feeds from all the venues were full of pictures of the Cup and I have put the links to a couple of club Facebook pages below. The next day the Trophy our was off to Cambridge although I wasn’t able to go with because of work commitments. First stop was Cambridge Rugby Club which was added to the original schedule at the request of Societe Generale, one of the tournament’s main sponsors, who also support the Cambridge club through a subsidiary. Then it went Parker’s Piece, a large area of open land in the centre of the city where Rob Andrew was the guest of honour. There was a steady stream of people to see the Trophy and with the rain holding off until it was nearly time to pack up. All in all a very good couple of days where Eastern Counties got to be the centre of attention as far as the Trophy Tour was concerned. ITV Anglia gave it excellent coverage on the first day with the report below well worth having a look at. A big thank you to the local organisers Paul Gibson at L&Y, John Winders at Ipswich, Maggie Whiteman at Colchester and Deborah Griffin with Alasdair Bovaird from Cambridge University and Cambridgeshire RFU. Also to RDOs Jonathan Pearce and Sam Carpenter who spent a long two days along with their staff helping to make things run smoothly and finally to Emily and Lisa and the rest of the Trophy Tour crew who had already spent 62 days travelling around the country and have another 38 days to go. How they manage to stay so cheerful and enthusiastic is beyond me but it is clear how much they love their job.